As a wedding officiant in Central Virginia, I’d like to congratulate you on your decision to get married! Finding someone to spend your life with is a beautiful feeling and deciding that you are ready to commit to each other is deeply empowering. I wish you all the happiness and satisfaction that marriage can bring. I look forward to speaking with you about your upcoming wedding. Hello, my name is Sully Carter. 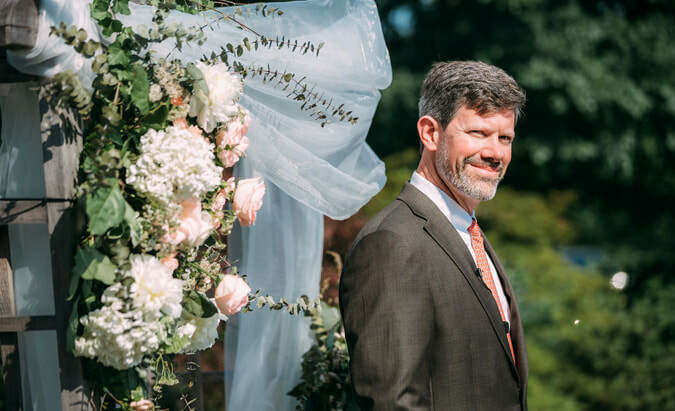 I'm an authorized officiant in Virginia, also known as a marriage celebrant. I will be happy to work with you to create a ceremony that reflects you and your fiancé. Sometimes couples feel uncertain navigating unfamiliar wedding traditions in a modern world. Marriage is an ancient custom that accommodates each couple that commits to it. I am happy to share my experience to guide you through the process and work with you to incorporate your ideas and inspirations. I strive to make your ceremony look and sound the way you imagined it. After all, your wedding ceremony should reflect the love you share with one another. Thirteen years ago a friend of mine asked me to perform his wedding. He and his fiancée were not connected to a local church. I had never considered officiating a wedding. After some research and support from my community I was able to get the authorization to perform the wedding. I enjoyed the whole experience, preparing for the wedding and officiating the ceremony. It felt as though I was meant to do this. Since that time I have been privileged to guide dozens of couples through this significant event. Wondering where to elope? I can help you find a beautiful place here for your wedding in the country. I have some suggestions below on the Venues link. I am located in beautiful Orange, Virginia. My home is far from the traffic and congestion of the city with rolling hills, horse farms, vineyards and mountain views. It has been my honor to work with couples like you in a variety of locations throughout Central Virginia. This picturesque area is a wonderful backdrop for your big event under the tent, in the hall or your intimate barn wedding. If you have already chosen a venue I can easily travel to you in the Charlottesville, Fredericksburg, Culpeper, Richmond, Roanoke or anywhere else in Virginia. I have officiated weddings all over the state of Virginia. We had a beautiful wedding day, and so greatly enjoyed the planning process in which we discussed our ideas and created a meaningful, personal, and original ceremony with the warm, wise and humorous guidance of our officiant, Mr. Sully Carter. We were so grateful to have met Sully, and to have him calmly at the helm on our wedding day. A great listener, and an even better speaker, Mr. Carter is the rare combination of a crowd easer and pleaser - - we could not have asked for any more! We were high school sweethearts and after several years of dating we decided to get married. We had been to many weddings, and knew what we wanted and what we did not want. A family member suggested Sully. Sully was very professional and met with us several times. He wanted to know what we wanted in our wedding. He took the time to interview us. Sully had many programs, ideas, and suggestions. We wanted a spiritual wedding that had personal meaning to us in our faith. We also wanted our family involved. Sully was willing and able to provide everything we wanted, even keep the surprise guest singer a secret. With every meeting, Sully was prepared. He listened and understood. On the day of the wedding, he became the leader of the event. What we liked about Sully was that he was prepared, calm, and knew how to guide us through this special day. Even when our mothers forgot to light the candle, Sully was calm and readjusted the schedule to include it and no one knew our mothers forgot what to do. Sully’s voice is strong and clear. He spoke with conviction and truth. People heard and listened to him throughout the ceremony. Sully presented everything as within a conversation. He spoke of and quoted items of interest. Very personal. He was professional throughout the entire event. Sully Carter made our day very special. We highly recommend Sully Carter for anyone’s Day of Commitment! Sully was great to work with! We met with him well in advance of our wedding and talked about our ideas for the ceremony. He was very receptive to what we were thinking and made some wonderful suggestions for how to bring it all together. He took time to ask us about our relationship, how we’d met, our backgrounds, our families, etc. Using the information we gave him, he wrote a lovely ceremony that was exactly what we wanted. Sully’s style is very calm and soothing, yet engaging. Many of our guests commented on how beautiful and personal the ceremony was, and complimented Sully’s work. We couldn’t have been happier with our wedding service and are most grateful to Sully for making it so meaningful.